Primera Air and the IATA codes of PF (Primera Air Scandinavia) and 6F (Primera Air Nordic) have been suspended as of midnight (October 2, 2018). On behalf of Primera Air team, we would like to thank you for your loyalty. On this sad day we are saying Goodbye to all of you. Tour Operator passengers are kindly suggested to address their Tour Operators and Agents for further information and actions. Kindly understand that the usual options for contacts (via email or phone) can not be offered any longer. The growing airline had big plans for transatlantic low-cost flights. The airline is filing for bankruptcy after it was unable to reach an agreement with its bank for this aggressive expansion. Operations will cease tonight at midnight. Top Copyright Photo (all others by Primera Air): Primera Air (Scandinavia) Airbus A321-251N WL OY-PAE (msn 8312) IAD (Brian McDonough). Image: 943427. 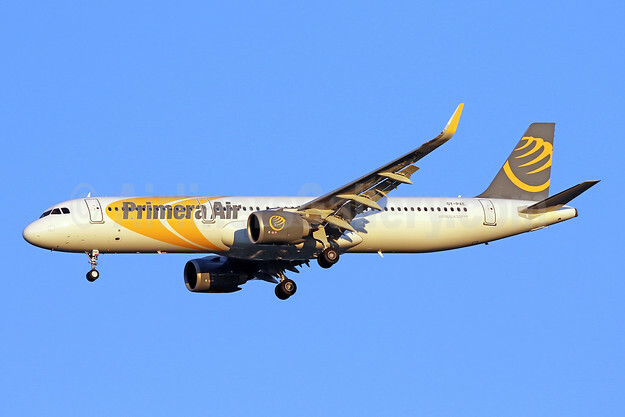 This entry was posted in Primera Air (Nordic), Primera Air (Scandinavia) and tagged Airbus A321-251N, msn 8312, Primera Air, Primera Air (Nordic), Primera Air (Scandinavia), WL OY-PAE on October 1, 2018 by Bruce Drum.